From left to right: Matt McCallum, Andreea Gheorghita, Ondrej Halgas, Natalie Bamford and Thomas Bateman. 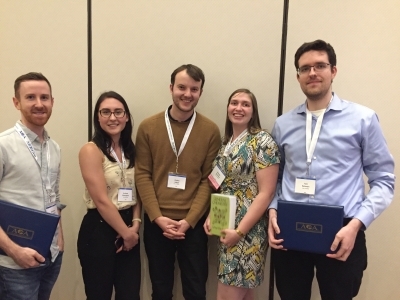 Congratulations to graduate students: Matt McCallum, Andreea Gheorghita, and Thomas Bateman for winning the Pauling Poster Prizes and Ondrej Halgas and Natalie Bamford for winning the Taylor & Francis Biomolecular Crystallography Poster Prize and the Louis Delbaere Pauling Poster Prize, respectively, at the 2018 American Crystallographic Association (ACA) meeting held at the Sheraton Hotel, Toronto, July 22-26. A special congratulations to Andreea Gheorghita for also winning the inaugural ACA Three minute thesis competition.